Some writers, I’m told, are really doing well with eBooks. I am not one of those writers: I am, instead, a writer who is selling paper backs in local books and out of the trunk of my car. I’m no expert on the subject, but I am definitely more of an expert at than I am at selling eBooks. eBooks may be popular, but I sell most of my books locally. It’s a lot of work, but it’s rewarding. For example: today, I had a local area resident ask me if the local bookstore still carried my books. I said, yes they did, that they were supposed to be in the Fantasy section, but another reader told me he found the book “The Moon Cried Blood” in Young Adult – but they should have been reshelved since. So, I went down there to drop off a copy of my latest book (“Warmth)”, and checked to see where the books were actually shelved. Getting in bookstores? Hard work. Finding your books shelved next to Tolkien? Priceless. 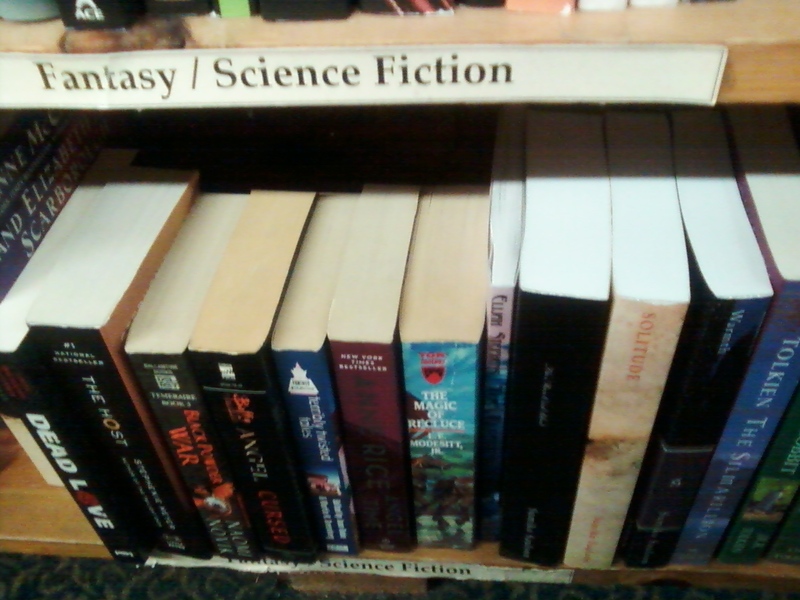 It turns out they were in the Fantasy/Science-Fiction section: which happened to be located in the shame bookshelf as the Young Adult section, and also happened to be very small. It was so small it took up two shelves. It was also small enough that my last name, Saulson, was alphabetically nearest the author Tolkien. I was in for another pleasant surprise: two of the five books I’d left at the store had sold. 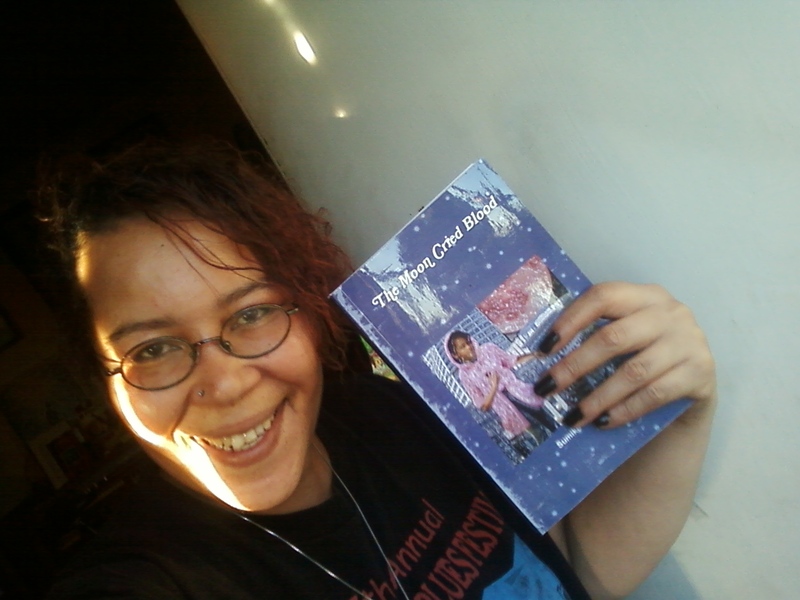 I picked up my check (for around $23) and dropped off two copies of my latest book. The books, you see, are on consignment. But even if you get books into bookstores on consignment, you can’t just walk in and expect them to take your book. As an unknown writer, the bookstores most likely to take your book are small, local, and have limited shelving space. You’re going to have to sell them on carrying your book. In my experience, the average number of trips to a bookstore before getting a yes-or-no answer was three. And yes – I did say yes or no. Sometimes you’re going to show up two or three times before you hear the words “no” – every bookstore is not going to be so kind as to tell you “no” the first time out. Well – here is a list of things I did – and should have done. The first flyer I made for Solitude – with PowerPoint of all things. One of the first things that a bookstore is going to ask you is how your book is selling. The number of sales expected by a local bookstore isn’t all that high: what they are really asking is, “is your book selling?” and “are you promoting your book”. If your book ends up their bookstore, it’s not going to immediately fly off the shelves. An unstated question is the following: are you promoting your book to a local audience that will come into the bookstore? They do not want to know how much you are selling online. In fact, selling primarily online could be a conflict with promoting it in local stores. Promoting it locally means making fliers and dropping them off in local coffee stores: trying to get local neighborhood or school papers to review or write about it, basically doing everything for the book you’d do if you had a local band. That includes selling books (rather than CDs) out of a backpack or the trunk of your car until you manage to get your book into a store. 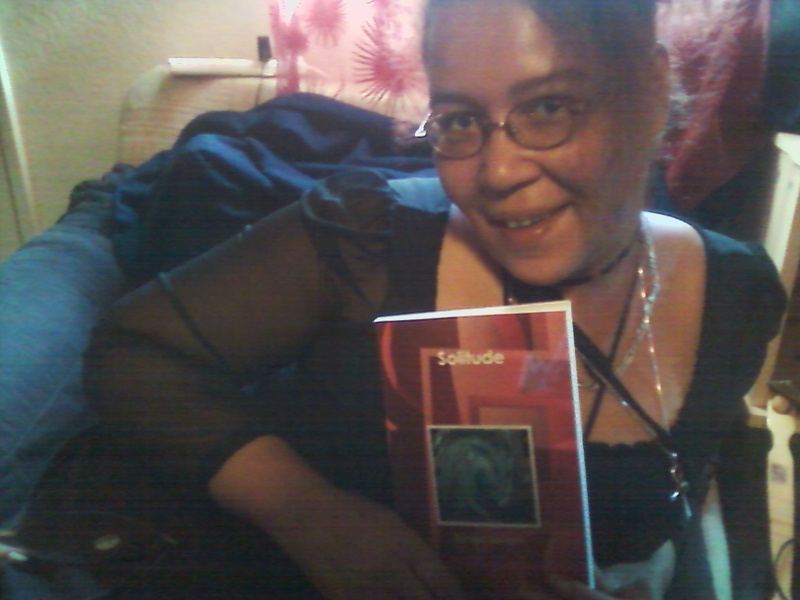 Me with the first proof copy of Solitude, posing. It would take me a while to realize that I looked suspiciously like something I’m not… a romance author. If you have an online presence, pump it up there – but be careful. If you’re too pushy or if you spam, you’re just going to alienate your friends, family and neighbors. You don’t want to do that. The first few sales you make are going to be friends, or family. If they read your book and decide they like it – your friends, family, and neighbors will be the first ones selling your book. Some of your friends are going to be reluctant to read your book: they will wait to see what other people think. You really want to appreciate the people who enjoy what you’ve written enough to share it. You also want to appreciate the people who BUY it. It took me a while to understand that part, because some people will buy it just to be supportive. Show them some love. But me? I love having readers. I love it when someone talks to me about one of my books and they know the story and the characters: it’s like magic. But they don’t get the books through magic. They get it through hard work. 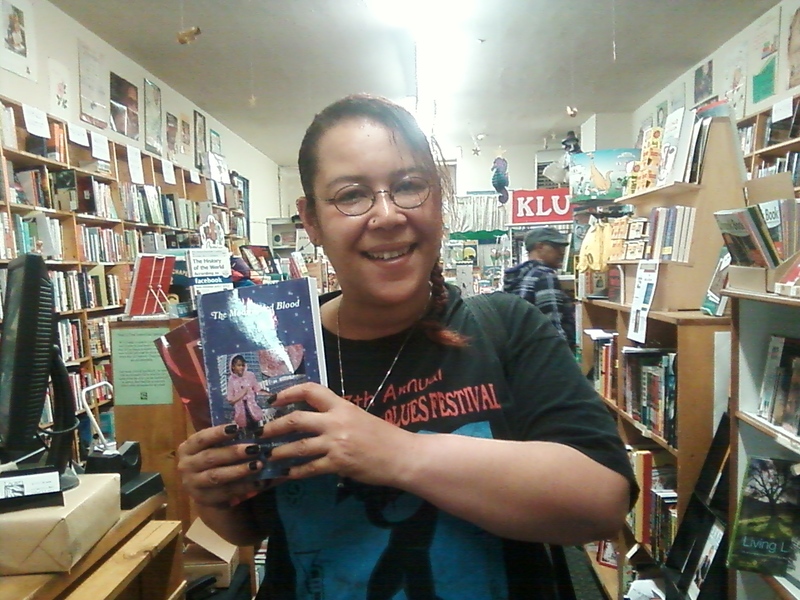 Me proudly waving around my first proof copy of “The Moon Cried Blood” – before I got feedback that the cover art made it look Y.A. when it’s not. Most bookstores that will take self-published and very small press books won’t accept them unless they feel you have done your due professional diligence in making them look professional. I will be honest… my books have changed a lot. The first copies of many of my books have typos. One of them even has a typo on the back cover, and there’s a reason for that: it’s a lot easier to get someone to read/proofread/edit a book that is already in existence if you do not have a publisher other than yourself and if no one has ever heard of you. The natural urge is going to be to run out and give books to people who will review your books first: but hold your horses. It’s a better idea to get copies of the book into the hands of people who will help you straighten out these kinds of errors. Think: people like your former English teacher (mine has an unedited copy of Solitude which HAS been edited and she’s apparently making notes and proofreading it anyway) or anyone in your family who happens to spell well as a proofreader. 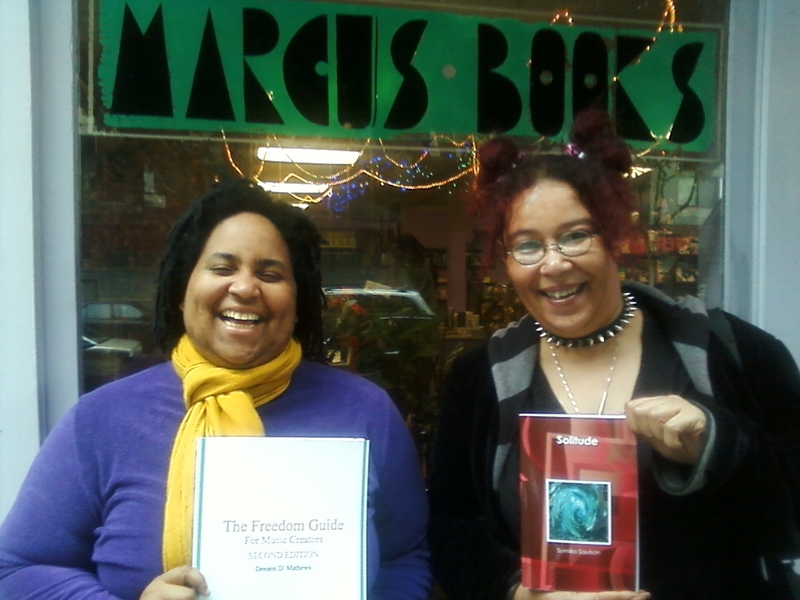 Author Deeann Mathews and myself in front of Marcus Bookstore in San Francisco. someone proofread/edit your book, but many will: typo-laden books are the big, new headache of the self-publishing age. If the bookstore gives you a list of criteria you need to fulfill to get in, that’s not the same as a “no”… that’s just one in many visits you will have to make to learn and meet the criteria they have set forth in order to “sell” the idea of carrying your book. And when and if they say yes, you will be one happy author. Me in my local bookstore, Laurel Bookstore in the Laurel District in Oakland. This is the neighborhood promotion postcard I started with locally. authors. If you find out what the absolute nearest-to-you in your neighborhood or the closest possible neighborhood bookstore there is, you will be even more local than authors just from the same city. And you know what? 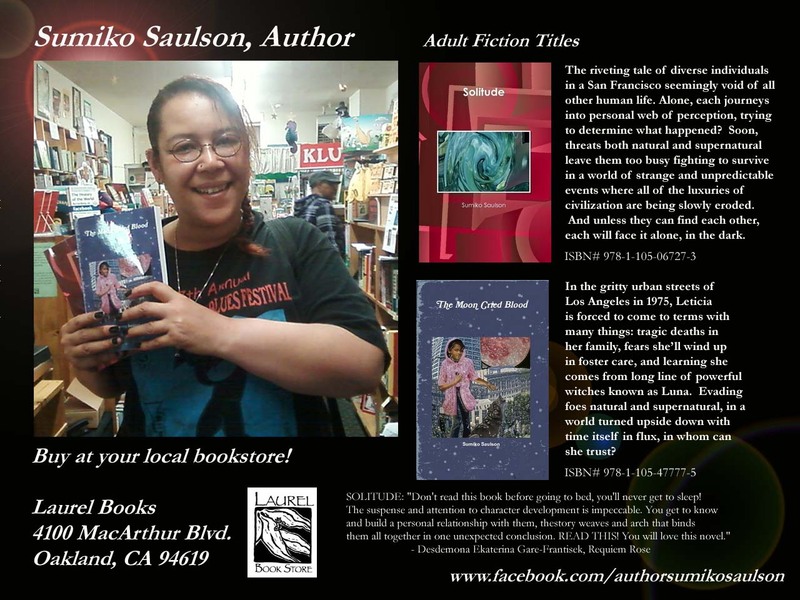 It is very easy to promote your presence in a very-local neighborhood bookstore, because you are already in constant contact with people where you live. I just carry postcards in my pocket and drop them off in local cafes and eateries and hair salons while I am out doing my thing. My local bookstore is Laurel Bookstore in the Laurel District here in Oakland – actually the next neighborhood over (I live in the Fairfax District, which doesn’t have its own bookstore.) The books aren’t just there – they’re selling well. It is the only store that carries all three of my titles – and that makes sense. The only place on planet Earth that I am a “known” writer is in my neighborhood. 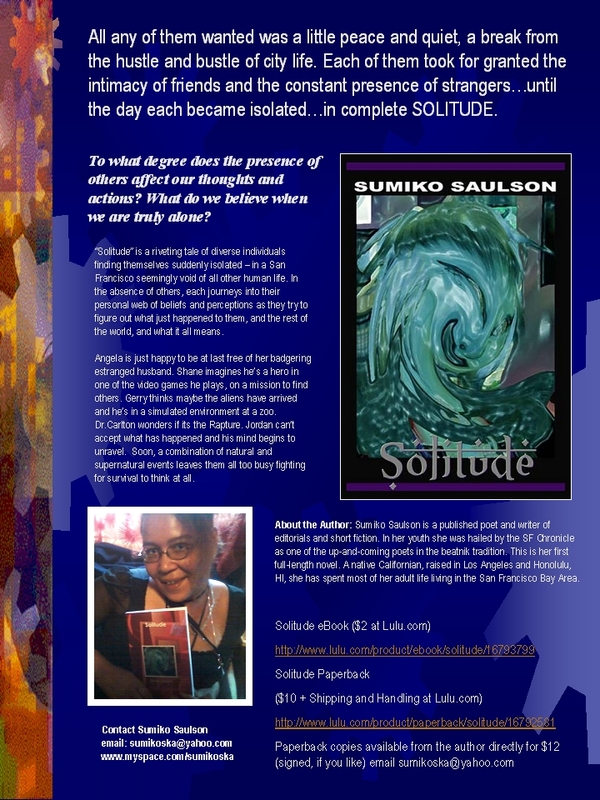 Everywhere else, I have to sell on strength of my book’s description, and it’s easier to sell the one book (“Solitude”). In my neighborhood, I have a dozen or so people who have read one book and want to read the others. I also have people who see the postcards and go “hey, that’s so-and-so up the street” and their interest is peaked. Being in your local bookstore can bring you a lot of joy. ~ by Sumiko Saulson on April 24, 2012.